McMaster graduates Alexis Liddell and Chris Benoit don’t have a lot in common. She is a Humanities/Social Sciences graduate working in the long-term care field; he received his degree in Software Engineering and is working in mobile app development. However, the two siblings have joined together on a project that is near and dear to both of them. 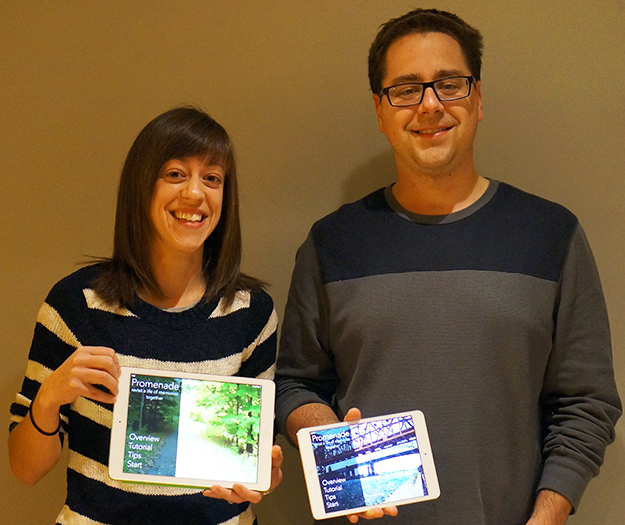 Inspired by their experiences visiting an aging relative in long-term care, the two developed an iPad app designed to improve visits with loved ones living with dementia. Benoit took the idea and used his skills in software development to make it a reality. “Looking at the apps on the market today, we found there was a real gap in terms of communication tools, especially for seniors. Promenade is designed to fill that gap,” he said. The app combines high-resolution photos with sensory-based conversation questions in a way that makes it easier for those with dementia to reminisce about past life events and experiences. A reminiscence therapy tool at its core, the app’s photos provide the visual cue needed to help trigger the memories, and the questions provide an opportunity for the visiting family member or caregiver to help expand on that memory and discuss the details surrounding it. Their next step with the app is spreading the word. The duo have recently made presentations to the Alzheimer’s Society, Mohawk College’s Recreation and Leisure Services program and Hamilton/Niagara’s Regional Family Council Network. They were also invited to present at the annual conferences for the Canadian Therapeutic Recreation Association (CTRA) and Therapeutic Recreation Ontario (TRO). With the app now launched, the pair have added another cross-disciplinary piece into the mix. Liddell’s husband Ryan, a graduate of the DeGroote School of Business and a current employee in the Faculty of Health Sciences, has been assisting with the development and promotion of Promenade. “I’m proud to be able to play a small part in this. They’ve created a great product, so that makes it easier when it comes to promotion,” he said. Promenade is available through the Apple App Store and is compatible with any iPad that runs iOS7. Promenade Waltkthrough from Chris Benoit on Vimeo. McMaster graduates Alexis Liddell and Chris Benoit don’t have a lot in common. She is a Humanities/Social Sciences graduate working in the long-term care field; he received his degree in Software Engineering and is working in mobile app development. However, the two siblings have joined together on a project that is near and dear to both of them. Inspired by their experiences visiting an aging relative in long-term care, the two developed an iPad app designed to improve visits with loved ones living with dementia. Dubbed <a href="http://www.promenadeapp.com/" target="_blank">Promenade</a>, the app was the brainchild of Liddell, who works with dementia-sufferers daily as a therapeutic recreationist. “Communicating with those we love is a daily struggle for so many sons and daughters of dementia sufferers,” she explained. “Our hope is that Promenade can make visits more enjoyable for everyone involved.” Benoit took the idea and used his skills in software development to make it a reality. “Looking at the apps on the market today, we found there was a real gap in terms of communication tools, especially for seniors. <i>Promenade</i> is designed to fill that gap,” he said. The app combines high-resolution photos with sensory-based conversation questions in a way that makes it easier for those with dementia to reminisce about past life events and experiences. A reminiscence therapy tool at its core, the app’s photos provide the visual cue needed to help trigger the memories, and the questions provide an opportunity for the visiting family member or caregiver to help expand on that memory and discuss the details surrounding it. <a href="http://www.thespec.com/news-story/4621233-sister-brother-team-creates-alzheimer-s-app/" target="_blank">Read about Promenade in The Hamilton Spectator</a> “It puts everyone on the same page,” explained Liddell. “We wanted an easier way to tap into the long term memories of individuals with dementia. These memories typically remain intact for a significantly longer period time than the short term. We want to utilize what’s still there.” Their next step with the app is spreading the word. The duo have recently made presentations to the Alzheimer’s Society, Mohawk College’s Recreation and Leisure Services program and Hamilton/Niagara’s Regional Family Council Network. They were also invited to present at the annual conferences for the Canadian Therapeutic Recreation Association (CTRA) and Therapeutic Recreation Ontario (TRO). “We’ve been getting really positive feedback from users,” Liddell said. “It’s gratifying to see how our app can help turn around what can oftentimes be a frustrating or upsetting experience. It’s all about seeing your loved one engaged again.” With the app now launched, the pair have added another cross-disciplinary piece into the mix. Liddell’s husband Ryan, a graduate of the DeGroote School of Business and a current employee in the Faculty of Health Sciences, has been assisting with the development and promotion of Promenade. “I’m proud to be able to play a small part in this. They’ve created a great product, so that makes it easier when it comes to promotion,” he said. Promenade is available through the Apple App Store and is compatible with any iPad that runs iOS7. <iframe src="//player.vimeo.com/video/90460922" height="468" width="625" allowfullscreen="" frameborder="0"></iframe> <a href="http://vimeo.com/90460922">Promenade Waltkthrough</a> from <a href="http://vimeo.com/user26441684">Chris Benoit</a> on <a href="https://vimeo.com">Vimeo</a>.